There are certain skills that come in handy within the professional world. For instance, good grammar makes a difference. Taking charge within a project demonstrates leadership skills. And of course, there’s the big one: the one skill so many of us fear. Public speaking. According to Forbes, only about 10% of the population actually enjoys public speaking. Another 80% feel anxious and nervous before a presentation. And the last 10% are genuinely terrified by the thought of public speaking. These people can even experience nausea, panic attacks and extreme anxiety. Public speaking is a valuable skill that’s often necessary within the professional world. So how can you overcome anxiety and become a better public speaker? Let’s find out. The first step in becoming a public speaker is to simplify your message into one main concept. If your audience needs to walk away knowing one thing, what would it be? Use that concept as your focus for the presentation and continually refer back to it throughout. If you overload the speech with too much content, audience members will end up not remembering anything. However, if you can drill into their minds one thing, focus on that. Keep slides to a minimum. We all know about presentation software. When used correctly, slides can be a valuable tool that amplifies your presentation. When used incorrectly, slides can be confusing, overbearing and draw the attention from you. When you put together your presentation, be sure to keep the number of slides to a bare minimum, with wording as simple as possible. You want the audience to look to you for information, not to the slides. When preparing your speech, memorize concepts, not content. Have a strong grasp on what you want to say, but not necessarily how to say it. This will make you appear more relaxed and conversational, rather than robotic. When you act like yourself, people will feel more engaged—like in an actual conversation, instead of just a presentation. Stop repeating yourself. Stop repeating yourself. Once you share a concept, let it be, rather than continuing to circle back to that same idea. Repeating phrases or concepts makes you look scattered and unprofessional. The more you repeat yourself, the less interested audience members will feel, so be sure to run through your speech beforehand and make sure everything you say is new and engaging. More than 90% of communication is nonverbal. This means that even if your content is great, if your voice is bland, gestures are nonexistent and facial expressions are boring, audience members will not listen. Be aware of your nonverbal communication throughout your presentation and how that may be interpreted by others. Finally, the age-old mantra: practice makes perfect. Practice, practice, practice your presentation beforehand so you can remember the concepts, nail down your nonverbals and be conversational. The more comfortable you are with your presentation, the better you will do in front of audience members. 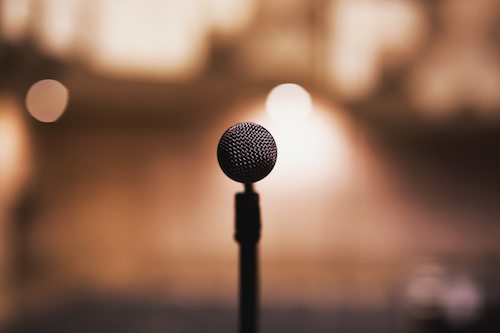 Public speaking can be scary, but it doesn’t have to be. If you remember these tips and practice beforehand, your presentation is sure to be a hit. Give them a try to see how you can develop your public speaking skills and grow professionally.